AIM Specialty Materials Division specializes in alloys of Indium, Tin, Lead, Bismuth, Cadmium, Gold and Gallium for a wide range of joining applications. 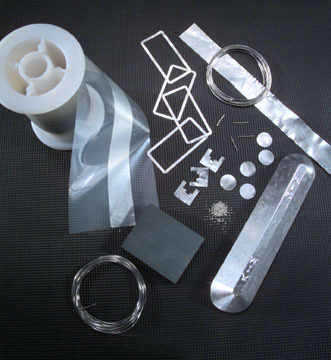 These materials come in a variety of forms, including wire, foil & ribbon, seals, pastes, chemicals and compounds. Please select a link below to learn more about our specialty solder products. If you are searching for information that you cannot find on our website or have questions specific to your assembly process, please contact us. Solder Preforms - wide range of alloys/melt points ranging from 60°C to 356°C. These alloys include gold-tin/gold-germanium, pure indium and indium alloys, RoHS compliant lead-free alloys, and standard tin-lead compositions. We invite you to discover the advantages of working with a partner driven by new product development & technology, quality & consistency, and the pursuit of 100% customer satisfaction.